I primarily think of cabbage as wintertime fare. Because it stores so well, I can buy fresh cabbage locally even in the depth of winter, a time when most other vegetables must be shipped to Maine from warmer regions. Storage cabbages, according to the Maine Organic Farmers and Growers Association, if kept at around 32 degrees and in a high-humidity environment, will keep up to about eight months. But count backwards from St. Patrick’s Day braised corned beef and cabbage and you get summer cabbages in all their glory. The author drizzles olive oil into a blender to make spicy aioli that gets drizzled on charred cabbage. In summers past, I rarely gave the cabbages at local farmers markets a second glance. Given the abundance of juicy tomatoes and tender leaf lettuce, neither the green storage cabbages (aptly named by seed companies with monikers like Storage No. 4) nor the smaller, tightly wound purple-red ones held much appeal. But this summer, I’ve noticed more varieties of cabbage at the farmers markets than ever before: dark green Savoy cabbages with their deeply crinkled leaves and mild sweet flavor; round, flat-headed Drumheads that don’t roll away when you attempt to slice them thinly for summer slaws; and conical heirloom cultivars with names like Oxheart and Early Jersey Wakefield. My editor tells me she likes the especially pointy-headed Spitzkohl because its funny shape makes her laugh. Have these been in markets all along, but I’ve never noticed? Farmers tell me that few pests and abundant dry weather have made this summer a particularly good one for cabbage. Drawn to these new-to-me varieties, I’ve begun serving cabbage in the height of summer. Yes, there have been slaws, as those are quick and easy and if I use the same sweet and sour dressing, it’s easy to see and taste the difference among the summer cabbage varieties and to coax others to give them a try, too. As fellow cookbook author Deborah Madison writes in “Vegetable Literacy,” “even those who live on barbecue are bound to encounter coleslaw on a regular basis” so slaw is a good vehicle for getting a variety of vegetables on the table. But, I’ve also been cooking the summer cabbages. Not the long-simmering processes that earned them their unfortunate reputation as being stinky and strong-tasting; instead, as Madison advises, cooked relatively briefly so that cabbage’s delicate taste can be taken in many directions. Madison follows just two rules when cooking summer cabbages. The first is to include an acid, such as lemon juice or apple cider vinegar, in recipes that call for heating red cabbage, or the vegetable will turn blue. 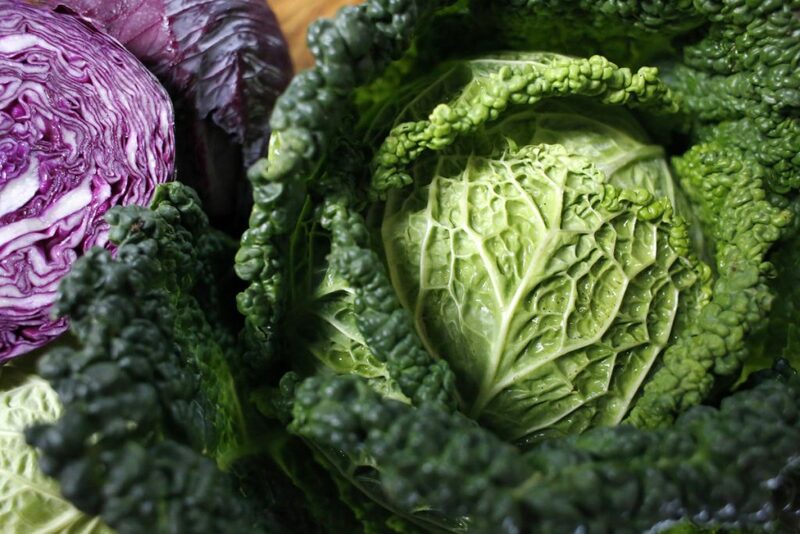 The second, I’ve found, is no hardship: Eat summer cabbages early and often as, like most summer vegetables, these interesting summer cabbage varieties won’t stick around. In his cookbook, “Eat a Little Better,” former White House chef Sam Kass focuses on tips and techniques for home cooks to produce dishes that are both good for a body and good for the planet. To get folks to eat more cabbage, he chars it in the oven so the outsides get dark and crisp while the meaty core turns juicy. And he’s right on trend by serving it with a spicy aioli. 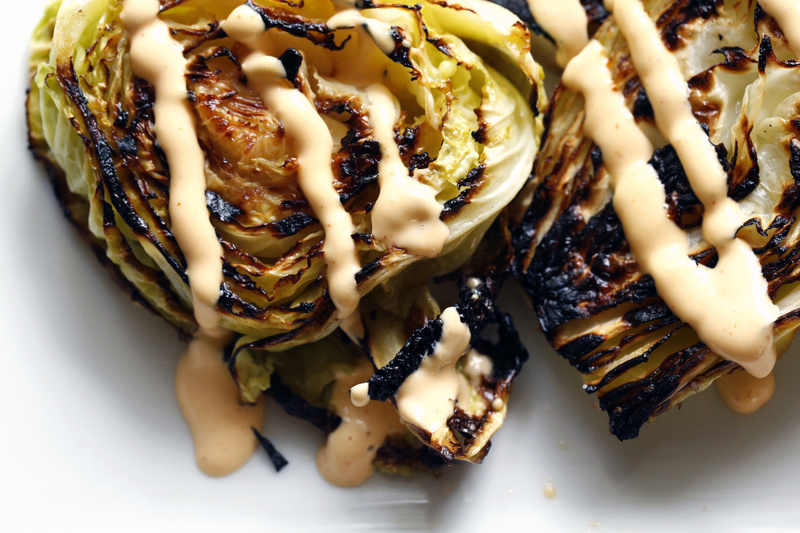 Charred cabbage with spicy aioli. Preheat the oven to 425 degrees F. Line a baking sheet with a silicon mat or parchment paper. Rub the slabs of cabbage with the olive oil. Generously season both sides of cabbage slabs with salt and place the cabbage cut side down in on a single layer on the baking sheet. Roast without flipping until the cabbage is tender and the bottoms are deeply brown, 35-35 minutes. Use a spatula to flip the slices, turn of the oven and cook 5 minutes more in the oven’s residual heat. Transfer the cabbage to serving platter and season with salt to taste. While the cabbage is roasting, make the aioli by combining the egg, lemon juice, sriracha, garlic and ½ teaspoon salt in a blender. 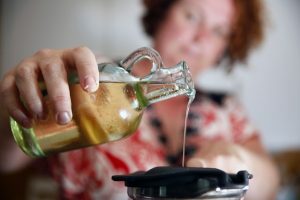 Start blending, then with the motor running, pour in the oil in a slow, thin, steady stream until you’ve added it all. Keep blending until the aioli is thick and creamy. Season to taste with more salt if necessary. Slather aioli on the cabbage and serve.